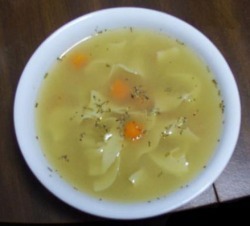 If you have never experienced homemade chicken soup then you are in for a treat with this recipe. Although it is simple to make it will take a few hours to simmer etc, but absolutely worth the wait!! 1 large chicken approx 2.25kg(quartered) or a similar weight in chicken thighs (much cheaper and probably turns out better anyway). Place the chicken in a large saucepan with 1 onion, 1 carrot, 1 celery stick all quartered, the garlic cloves and bay leaves and cover with water. Bring to the boil and let simmer for 1 hour or until the meat pulls away from the bones. Lift the chicken pieces out of the saucepan with a slotted spoon and allow to cool. Remove the onion, carrot, celery and garlic and reserve. Once cool enough to handle, pull the chicken off the bones and set aside. Skim away some of the excess fat from the surface of the stock, then return the the chicken bones to the saucepan . Add about 500ml/1 pint of water, bring back to the boil, cover and simmer for an hour. Strain the stock through a sieve and return the liquid to the pan. Put the reserved cooked vegetables into a food processor or blender with a spoonful of the liquid and blend until smooth, then return to the saucepan. Finely chop the remaining onions, carrot and celery and add them to stock. Add the powdered chicken stock and cook for 20 minutes until the vegetables are tender. Add the chicken pieces and parsley, season too taste with salt and pepper and cook until the chicken is heated through. Divide the soup into 8 portions. When cool, these can be frozen and then served when you need a nice quick simple and delicious meal when your in a hurry or cant be bothered cooking!! You could also make some Oopsie rolls to serve along with the soup.